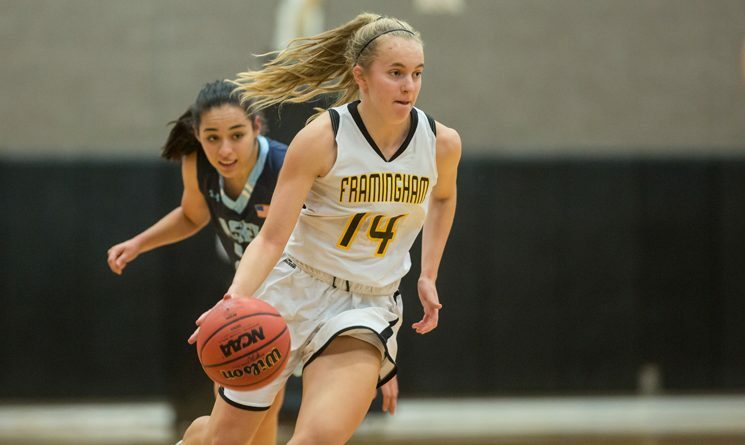 FRAMINGHAM – The Framingham State University women’s basketball team used a pair of runs, one in the opening quarter and one in the third quarter, to take control of the game as the Rams defeated Bridgewater State University 71-49, Saturday afternoon in Massachusetts State Collegiate Athletic Conference action at the Athletic Center in Framingham. With the win Framingham State improves to 12-5 overall and 4-1 in the Conference. Bridgewater State falls to 7-10 overall. · Bridgewater State led 4-0 with 7:58 left in the first quarter after buckets from junior Kayla Carter and senior Olivia DelGrosso. · The Rams would close the first quarter outscoring the Bears 21-2 over the final eight minutes and held the Bears without a field goal for over four minutes. Juniors Julia Sanborn and Mallory DeFeo paced the run with six and five points, respectively. · The Bears opened the second quarter with a 6-2 run cutting the deficit to 23-12, but the Rams pushed the lead back to 15 on a pair of free throws from sophomore Abbey Battaini with 2:35 left in the second. · The Bears closed the quarter with four straight points to head to the locker room trailing 27-16. · Bridgewater State trimmed the Rams lead to eight, 30-22, on a jumper by Carter with 7:20 on the clock in the third. · The Rams closed the period with a 24-3 run taking their largest lead of the game, 54-25, after three. Junior Mary Kate O’Day paced the Rams on the run with 11 points on the spurt including a pair from behind the arc. · The Rams extended their lead to as many as 31 on a three from Battaini midway through the fourth quarter. · O’Day finished the game with a game-high 20 points on seven-of-14 shooting from the floor including connecting on four-of-six from behind the arc. She added eight rebounds, three assists, and two steals. · Sanborn chipped in with 10 points and six rebounds, while senior Tiphani Harris also had 10 points with eight boards. DeFeo finished the game with nine points off the bench, while Battaini added eight. · The Bears were paced by 15 points and eight boards from sophomore Destiny Fitzgerald. Fitzgerald grabbed eight boards and added three blocks. · Senior Kailyn Aguiar,, who struggled with foul trouble in the first half, added eight points and three boards. · The Rams shot 47percent from the floor for the game and 37 percent from behind the arc, while the Bears connected on 35 percent of their offerings. The Rams are back in action on Thursday night when they travel to MCLA for a MASCAC match-up beginning at 7:30 p.m.